This particular post would describe a disappointment of mine. I watched the Top Gear episode about the Transfagarasan highway and nagged to go there. So we went but we had missed something - the weather was not in our favor. It rained all the way and to make matters worse - there was a 'nice' fog that combined with the torrential rain made taking decent pictures impossible... You'll see what I mean later on. In case you don't know where Romania is - I'll have to ask you to consult with Wikipedia. If you din't get much of the map - here we go - the big brown thing in the middle is the Carpathian mountains - the longest mountain in Romania (I think it is the highest as well). The red rectangle shows what I am talking about - where is the Transgarasan highway. 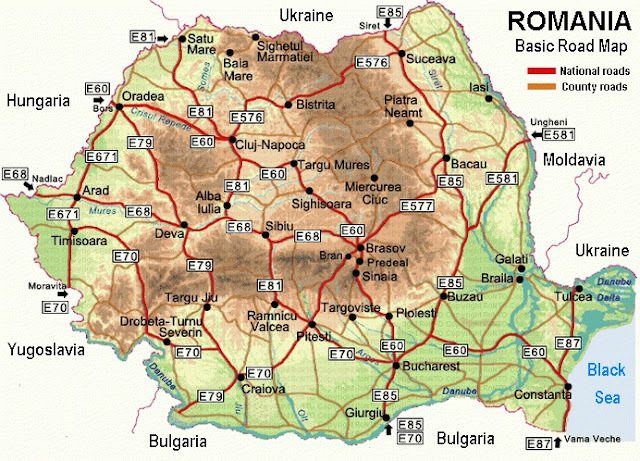 The road is known in Romania as National Road 7C - that means it is a wide road in good condition that is the shortcut from Curtea de Arges (down on the map) and Sibiu (up left). The name comes from the mountain of Fagaras and means "through Fagaras". There is also a town with the same name (up right on the map). The Transfăgărășan (trans (over, across) + Făgăraș) or DN7C is a mountain paved road crossing the southern section of the Carpathian Mountains. 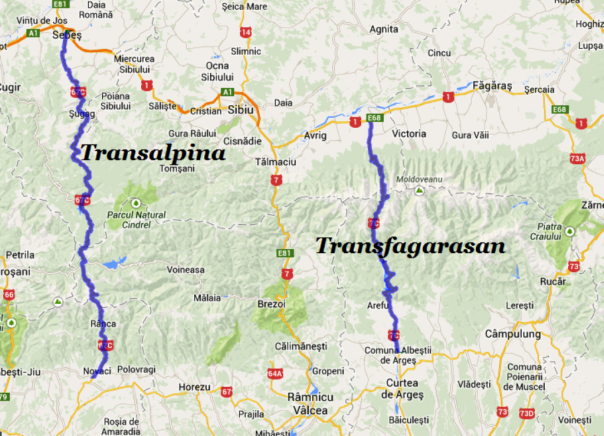 It has national-road ranking and it is the second-highest paved road in Romania after Transalpina. The road starts near the village of Bascov, located near the city of Pitesti, ending on the crossroad between DN1 and Sibiu. Also known as Ceaușescu's Folly, it was built as a strategic military route that stretches 90 km with twists and turns that run north to south across the tallest sections of the Southern Carpathians, between the highest peaks in the country, Moldoveanu, and the second highest, Negoiu. 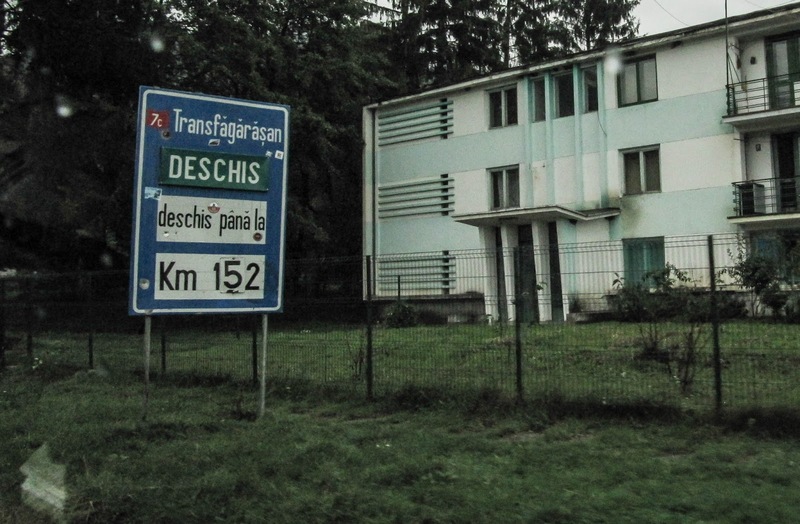 The road connects the historic regions of Transylvania and Wallachia, and the cities of Sibiu and Pitești. I'll try to be short here - the road is called Ceaușescu's Folly with a good reason. 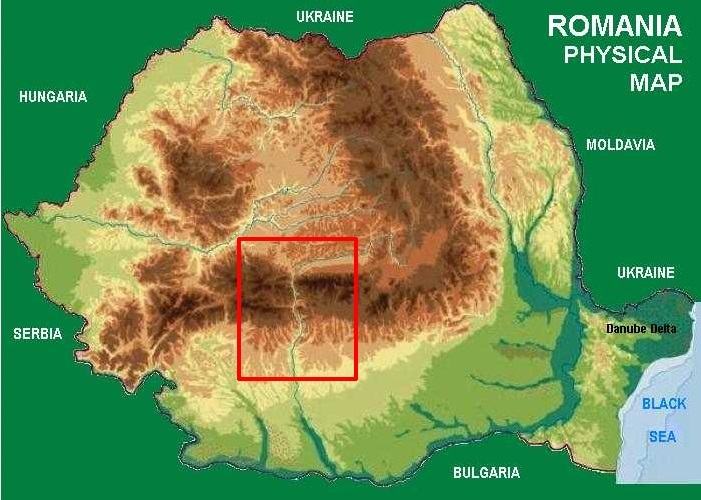 See, the dictator decided that he should have a quick access between Transylvania and Wallachia which is not along a river valley (so more difficult to attack - don't ask - military strategy and it's too long to explain) AND he decided to do something grander than the longer and higher Transalpina (see map below). Built mainly by military forces, the road had both a high financial and human cost. Work was carried out in an alpine climate, at an elevation of 2000 meters, using junior military personnel who were untrained in blasting techniques. Many non-commissioned officers (NCOs), foremen, and soldiers died due to hazardous working conditions. Roughly six million kilograms of dynamite were used on the northern face, and official records state that about 40 soldiers lost their lives in building accidents. These numbers are likely to be under–estimations due to Communist propaganda touting "greatest care for men. "The government could not admit the loss of so many lives caused by the disregard for labor protection rules.To this day, the exact number of lives lost is not known, yet survivors estimate the number to be in the hundreds. As you can see for yourself, Ceaușescu was not a very likable guy - probably one of the reasons he didn't die of old age in his bed (which, however, is not the topic of my post). OK, here we come to the real thing - the highway itself. There are a few things to sort out first. The name - I will keep spelling it without the diacritics (you know, those strange looking things above and below the letters in the name) because Romanian is full of them and I can't spell them all right. 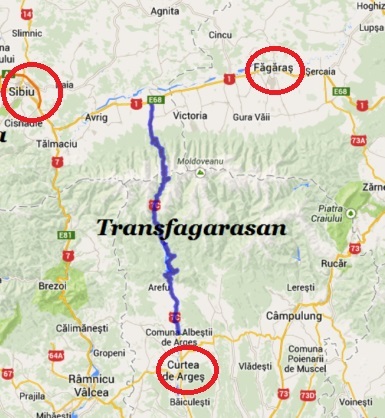 The actual pronunciation of the name is 'Transfagarashan' with a 'sh' sound even though throughout the post you will see it written (for convenience's sake) as Transfagarasan (with an s letter). The speed limit - in the video clip I have posted below you'll get the impression that it is an easy and quick drive. Truth is that the advisable AVERAGE speed should NOT EXCEED 40 kilometers per hour. If you think you can drive at a higher speed - you can - the road is a wide one and in a quite good condition in most places. But I think the views and the curves as well as the elevation on more than 2000 meters will quickly discourage you if common sense doesn't. The duration of the journey - average duration is 4 to 5 hours depending on traffic, weather conditions and well, how long you will be staying at the viewpoints. It is a busy road and Romanians do use it. To the natives of Sibiu it is the shortest way to get to Pitesti (another big city on the other side of the mountain). Romanians tend to drive dangerously so be on the alert. 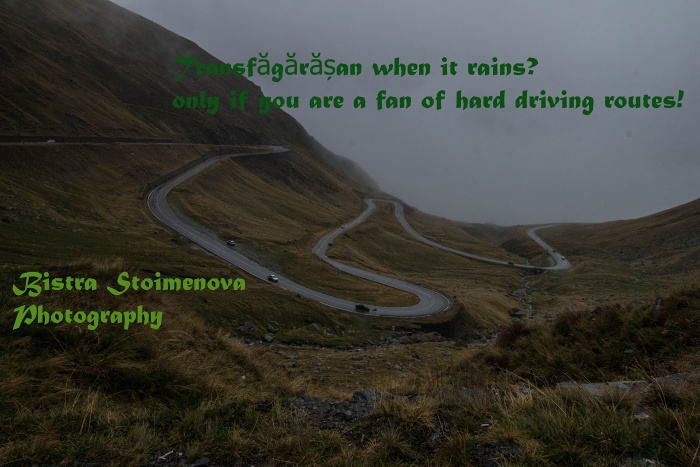 The weather - on most pictures of the Transfagarasan you'll see nice warm sun and fluffy white clouds and/or blue sky. Don't get fooled by that - it is COLD and by saying cold, I mean cold. Unless you are a polar bear, temperatures between 5 and 10 degrees Celsius in September would be cold or at least, chilly. What to do BEFORE you go there? - Check the weather forecast - if you don't want to see what I saw (you'll see the pictures and the clip later in the post) check and double check the forecast for Curtea de Arges (on the one side of the mountain) and Sibiu (on the other). You'll thank me for that, trust me. If it shows rain/showers/ thunderstorm in ANY OF THE TWO just DO NOT go. Chances are that if it rains on either side of the mountain, it would rain in it, too. It showed showers and we were rewarded by a torrential rain up there. Go in the rain ONLY if you have a long driving career and considerable amount of skills! Transfagarasan is generally closed between October/November and April/May the next year. However they close the serpentines (the top 50 kilometers with the scenic curves) when the weather is bad and the moment the first snow falls because of avalanche danger. Each year the period varies, so do your homework. - Check the car systems AND THE BRAKES!!! - DON'T EVEN THINK OF GOING THERE IF THERE IS SOMETHING WRONG WITH THE CAR. Transfagarasan is one of the most dangerous roads in Europe and the most common cause for death is a problem in the brakes of the car or somewhere else. Most of the high curves are not fenced so there is nothing that would stop your fall down the 1000 meter abyss. It is a beautiful place but caution first. GO ONLY IF YOUR CAR IS 100% WORKING! - Think twice if your car is fit to do it - If you drive a sports car, even though Romanian roads are amazingly good, you should think twice before using it on the Transfagarasan highway - it will perform well but for that journey (personal opinion) you'll need something higher (such as an SUV or a high hedge-back) because the viewpoints are 20 to even 30 centimeters BELOW the level of the road. So if your car is flat on the road imagine what would happen if you try to pull over and enjoy the landscape. The level difference is due to the abundance of water up there - they did it as a drainage of some sort. - Find a decent hotel - There are a few very nice places along the road which are in the lower parts of the pass and have amazing view but since Romanians love them too, you should book a hotel first. Don't count on coming and finding something on the spur of the moment! Also BEWARE OF WEDDINGS! if you happen to be in the area on a Saturday you have a very high chance of encountering a wedding. That in itself is not a problem and even seeing the bride brings good luck but that also means that you'll be an intruder in the restaurant - it is their day so they don't want tourists around. Also weddings on the Balkans mean a lot (I really mean A LOT ) of noise - generally local music blasting your eardrums out up till 4 or 5 AM. So if there is a wedding in your hotel (which unfortunately, you can't know in advance), you'll probably have to eat somewhere else. Posted by Bistra Stoimenova at 18:09 ч.
Noncho Iliev 13 октомври 2015 г., 19:57 ч.
За шофирането е ясно, че се кара бавно и внимателно по такъв екстремен проход. Реално главният път от Сибиу на юг е друг и повечето тръгнали по пътя са туристи. А за хотелите - Сибиу е на 50км от края на прохода на север и там има какво да се види. Bistra Stoimenova 13 октомври 2015 г., 22:53 ч.
Облачно време с малко дъждец е много драматично, но проливният дъжд в комбинация с мъгла не е. Колкото до снимката - на това се надявах и аз да го щракна. Но беше толкова кофти времето, че тези серпентини изобщо не съм ги видяла. Bistra Stoimenova 13 октомври 2015 г., 22:55 ч.
В следващият пост има малко кадри от онова, което видях. Ще има и още един, последен, където вероятно ще има най - много снимки от горе.